Did you resolve to decrease your spending by a certain amount this year? That’s a great financial goal to have, and one that can easily be achieved without making your life miserable. Just use the following baby steps to get to reach your goal. “Cut spending” isn’t exactly the best goal to have because it’s too vague. If that was your New Year’s resolution, then technically you could cross it off your list if you just decreased your spending by $1. Instead, make your goal more specific. How much do you want to cut from your spending? Is this amount per week, month, or year? Where will this extra money go to? For example, a better resolution would be: “Cut my overall spending by $100 a month to put into a savings account”. With this goal, you have a number you’re working toward, and you’re also giving that money a new job. The amount of money saved and where the money goes is totally up to you. You can put your money towards debt, vacation, or a new purchase. As long as you give yourself a more concrete goal, then you’re good to go. Now that you know how much you need to save each month, figure out which categories in your budget this amount will be coming from. Call every bill company you have and ask if there are any specials or discounts available. By doing this, my husband has saved $20-30 on our internet bill each month. I once called our car insurance company and just switched the drivers – that saved us about $20-40 a month, too. Look into changing services. We thought we were getting a good deal on our smartphones since we were on a family plan with my husband’s sister and brother-in-law. However, their phone usage was actually causing us to pay more (or at least, they were charging us more by splitting the bill evenly). By switching to our own line with a different phone company, and then utilizing the family plan to save my sister and father money, we cut our bill by $63/month, while keeping the same phones and perks! It’s a pain to change companies sometimes, but it can save you a lot of money in the long run. Try getting new quotes from the following providers: car insurance, health insurance, cable, internet, cell phones, and more. Change the way you use electricity. Electric bills always seem unpredictable, but by doing simple tasks each day, you can really save money. Simply unplugging unused devices and appliances can make a difference. The use of a Nest (a programmable thermostat), has allowed us to keep our electric bill under $100 almost every month (though it can get to $150-190 if we have a really hot summer month). Our Nest has also unlocked special promotions with our electric company. They give us a credit if they are allowed to control our temperature for a few hours for up to ten days during the summer. Just say no to fast food. Fast food is truly the biggest waste of money, but such a bad habit to break. Figure out how you can spend a little more at the grocery store to avoid running to fast food when you are in a pinch. Perhaps pre-chopped veggies will motivate you to cook more, or frozen meals will help you eat lunch at the office. There are many little tricks you can use to shave off money from each section of your budget. Make it your goal to find several of these tricks and try a new one each week. 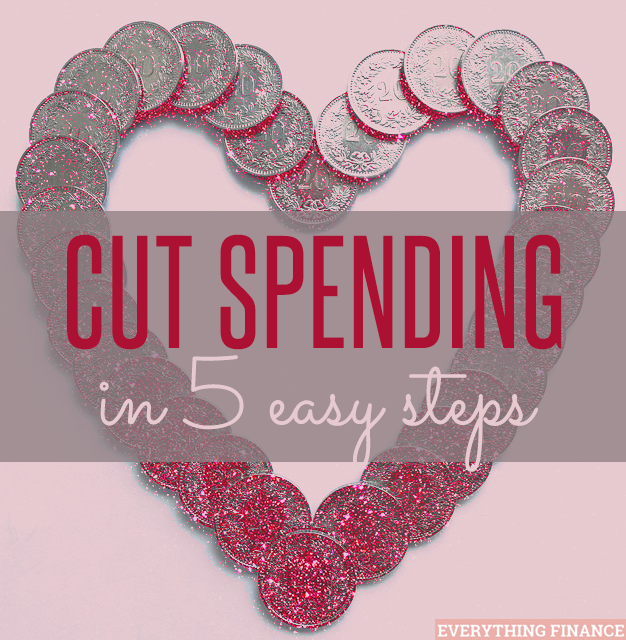 When it comes to cutting your overall spending, don’t look at it as an overwhelming goal. Instead, focus on taking small baby steps and getting to your goal of cutting $X each month. How have you cut down on your spending in the past? What did you do with the money you saved?